In this photo provided by South Korea Presidential Blue House via Yonhap News Agency, North Korean leader Kim Jong Un, right, and South Korean President Moon Jae-in, left, shake hands before their meeting at the northern side of the Panmunjom in North Korea, Saturday, May 26, 2018. Kim and Moon have met for the second time in a month to discuss peace commitments they reached in their first summit and Kim's potential meeting with President Donald Trump. VietPress USA (May 26, 2018): Today on Saturday, May 26, 2018, South Korean President Moon Jae-in and North Korean Leader Kim Jong-un held a surprise meeting for two hours on the North Korean side of the “truce village” of Panmunjom inside the Demilitarized Zone between the two Koreas. Mr. Yoon Young-chan, spokesman of the President Moon's office confirmed this second summit by two leaders of North and South Korea since their first summit held in the DMZ on April 27, 2018. The surprise meeting Saturday to rescue the break-off the summit scheduled on next June 12 between Trump and Kim in Singapore. Last Thursday on May 24, 2018, President Trump had canceled the summit, citing “open hostility” from North Korea directed at the U.S. and used bad word to call U.S. Vice President Mike Pence as "political dummy". President Trump referenced recent incendiary comments from North Korea and said: “Sadly, based on the tremendous anger and open hostility displayed in your most recent statement, I feel it is inappropriate at this time, to have this long planned meeting. A day later, on Friday May 25, 2018, President Donald Trump said his administration has restarted dialogue with North Korea following his cancellation of a historic summit, with the president suggesting that a meeting between the two countries could even take place on the originally scheduled date. Trump told reporters as he left the White House on his way to speak at the U.S. Naval Academy graduation, that "We'll see what happens. We're talking to them now." Trump said the two sides were engaged in "very productive" discussions, and a Singapore rapprochement might still be in the cards. The president told that the scrapped meeting with North Korean leader Kim Jong Un "could" still happen. Trump tweet "We are having very productive talks with North Korea about reinstating the Summit which, if it does happen, will likely remain in Singapore on the same date, June 12th., and, if necessary, will be extended beyond that date. 5:37 PM - May 25, 2018"
In this light of hope, the summit between leaders of two Koreans held today on Saturday for the purpose to easy the situation and to build a firm bridge for the coming historic summit between President Donald Trump and Leader of North Korea Kim Jong-un as scheduled in Singapore on next June 12, 2018. It wasn't immediately clear how the rivals organized what appeared to be an emergency summit. Ahead of their first summit last month, Kim and Moon established a hotline that they said would enable direct communication between the leaders and would be valuable to defuse crises, but it was unclear whether it was used to set up the latest meeting. Photos released by South Korea's presidential office showed Moon arriving at the northern side of the Panmunjom truce village and shaking hands with Kim's sister, Kim Yo Jong, before sitting down with Kim for their summit. 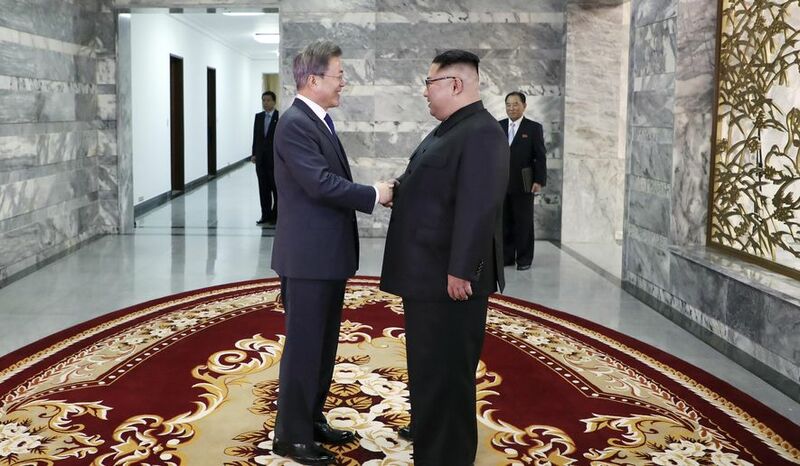 Moon's office said that during their two-hour meeting, the two leaders also discussed carrying out the peace commitments they agreed to at their first summit, held at Panmunjom on April 27, but didn't elaborate. At their first summit, Kim and Moon announced vague aspirations for a nuclear-free Korean Peninsula and permanent peace, which Seoul has tried to sell as a meaningful breakthrough to set up the summit with Trump. South Korea was caught off guard by the abrupt cancellation of the summit by Trump, who cited hostility in recent North Korean comments. Moon said Trump's decision left him "perplexed" and was "very regrettable." He urged Washington and Pyongyang to resolve their differences through "more direct and closer dialogue between their leaders." Trump's decision to pull out of the summit with Kim came just days after he hosted Moon in a White House meeting in which he openly cast doubts on the Singapore meeting but offered no support for continued inter-Korean progress, essentially ignoring the North's recent attempts to coerce the South. In a letter to Kim announcing the cancellation, Trump objected specifically to a statement from senior North Korean diplomat Choe Son Hui. She referred to Vice President Mike Pence as a "political dummy" for his earlier comments on North Korea and said it was up to the Americans whether they would "meet us at a meeting room or encounter us at nuclear-to-nuclear showdown."